On view in the Thinkspace project room is Underground, featuring new oil paintings by Los Angeles-based artist Matthew Grabelsky. His works combine a hyperrealistic painting technique with a surreal penchant for unlikely juxtapositions. 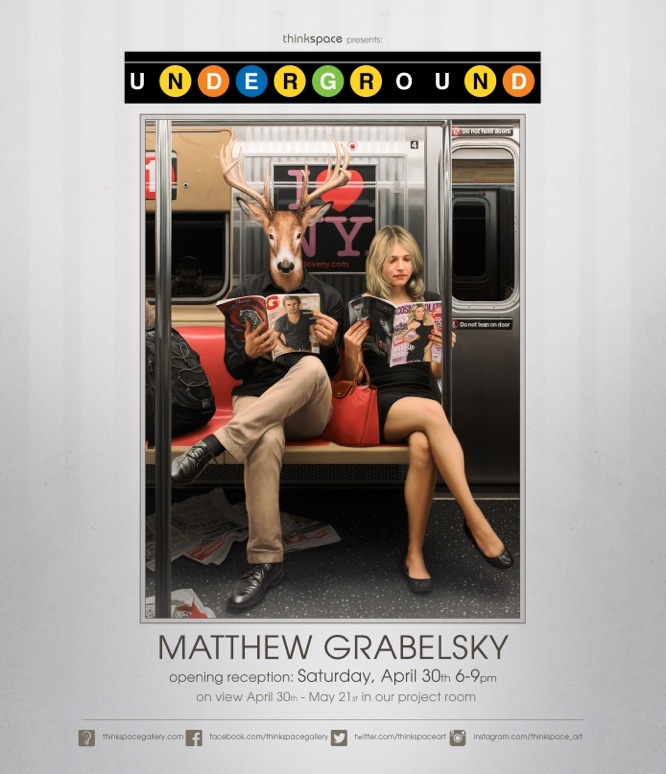 Raised in New York City, Grabelsky uses its subway’s underground world as the setting for his unlikely pairings. 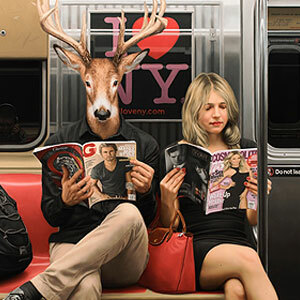 Grabelsky’s works depict couples on subways, often nonchalantly reading magazines or newspapers, but the male figures in these dyads are strange, quasi-mythological human hybrids with animal heads. Deer, bears, elephants, tigers, and everything in between, make a suited appearance in rush hour. By contrasting the platitudes of the day-to-day with the presence of the extraordinary and unlikely, Grabelsky stages the unexpected within the most unassuming of circumstances. The appearance of the animal head feels distantly totemic, an archetype for something primordial, ancient, and psychologically motivated. Fascinated by the persistence of animal imagery in mythology and communal cultural imaginaries, Grabelsky superimposes its presence onto his depictions of the contemporary world. For the artist, the animal becomes a manifestation of the inner workings of the hidden subconscious, literally revealing the latent identities and motivations lurking beyond the composure of the human mask. Technically inspired by 19th Century academic and naturalist painters, Grabelsky creates these unlikely, surreal scenes with a staggering degree of realistic detail. The contrast created between the visual verisimilitude of the works, and the surreal improbability of their content catches the viewer in a prolonged moment of convincingly suspended disbelief.